A unique exhibition was held at Kamadhenu Kalyana Mandapam, Luz on April 7. Different kinds of poultry were displayed, some were sold too. S. M. Navas Khan, the secretary of All India Aseel Organisation, says, “For the past four years, we have been having this exhibition in Dindigul. 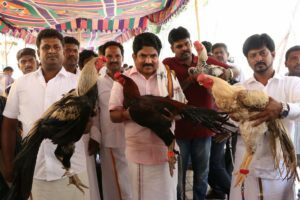 This being the fifth year, we wanted to do it in Chennai as we wanted the people here to get a feel of what happens at villages and farms and also create awareness about the need to protect and promote the native breeds of poultry”. He continues, “More than 100 varieties of male birds were displayed. Many of them were priced at Rs. 1 lakh or more. Chicks and female poultry, priced between Rs. 5000 and 15000, were sold too. We also had a competition wherein the top 25 birds were given shields and certificates”. This entry was posted on Monday, April 15th, 2019 and is filed under Community. You can follow any responses to this entry through the RSS 2.0 feed. You can skip to the end and leave a response. Pinging is currently not allowed.